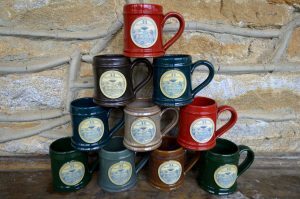 Beechwood Inn Logo Coffee Mugs: Our Mugs are American made by a family operation – Deneen Pottery. Over 24 pairs of hands will touch each mug during its production until it is ready to be shipped (It’s okay, we’ve washed them). While each piece is uniform in size and shape, every one is created by hand, making it unique. A custom hand thrown mug by Deneen Pottery truly makes a statement of American made quality and craftsmanship. Deneen Pottery is lead free and cadmium free, microwave, dishwasher and freezer safe and they are very very durable. $18.00 each or $34.00 a pair plus shipping.